Hundreds of voters queued up at Sayed Jamaludin Afghan polling center in Ayno Mena, Kandahar for the Parliamentary Elections in Afghanistan. 27 October 2018. The Taliban’s campaign of violence and intimidation during last month’s parliamentary elections in Afghanistan was the deadliest for civilians in years, a report by the United Nations mission in the country, UNAMA, revealed on Tuesday. The report, titled 2018 Elections Violence, shows that on 20 October and over the following days when delayed polling took place, the UN recorded 435 civilian casualties – 56 killed and 379 injured. Almost nine in 10 casualties happened on 20 October itself, making it the election day with the highest number of civilians killed and injured since the UN began its systematic documentation of civilian casualties in 2009. 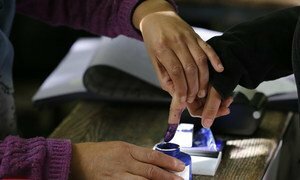 Shortly before polling centres opened on that day, the Taliban stated on Twitter that all election sites in the country would be under attack, cautioning citizens not to get involved in the elections process. Following the opening of the polling centres, UNAMA began receiving reports of attacks targeting polling centres, with the intensity of the attacks increasing throughout the day. The report notes that, according to the Independent Election Commission, of the approximately 8.8 million Afghans registered to vote, only 4.2 million cast a ballot, showing that large numbers were unwilling or unable to do so. “Those who made efforts to vote,” the report reads, “did so in defiance of an orchestrated campaign of abductions, threats, intimidation and harassment of voters and election workers carried out by the Taliban in the weeks and months leading up to the elections”. The report documents the numerous attacks by non-State armed groups, mainly the Taliban, in populated civilian areas, including attacks against schools, clinics and mosques used as polling centres. These attacks were mainly carried out using rockets, grenades and mortars, as well as improvised explosive devices. Shooting during ground fighting also occurred. More than 100 children and over 50 women were killed or injured in the violence. Overall, this is the highest level of election-related civilian harm compared to the four previous elections held in the country, especially when factoring in the casualties counted in the earlier months, since voter registration in April and throughout the campaigning period. “The Taliban’s actions forced many ordinary Afghans to choose between exercising their right to participate in the political process and risking their own safety,” UNAMA said, noting that unreasonably restricting someone’s right to take part in public affairs is a human rights violation. Welcoming Saturday’s parliamentary elections in Afghanistan, the United Nations Security Council called for continued engagement with electoral institutions and urged that any complaints over the vote should be channelled through established legal and constitutional mechanisms. 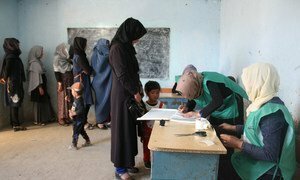 Against a backdrop of violence and technical malfunctions, the UN Mission in Afghanistan (UNAMA) has released a statement calling on the country’s electoral authorities to re-double their efforts to make sure all eligible voters are given a reasonable opportunity to cast their ballot.